Brown the beef over medium heat with the onion and taco seasoning. Set aside. Spray a casserole dish with non-stick cooking spray. 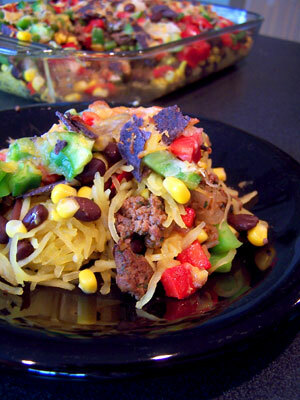 Spread the squash along the bottom of the dish, top with black beans, corn, cooked beef, diced peppers, tortilla chips and then cheese. Bake for about 30 minutes. Serve!